The NoHo Arts Center is a very nice theatre complex on Magnolia, where I saw a splendid Dracula way back in 2009. 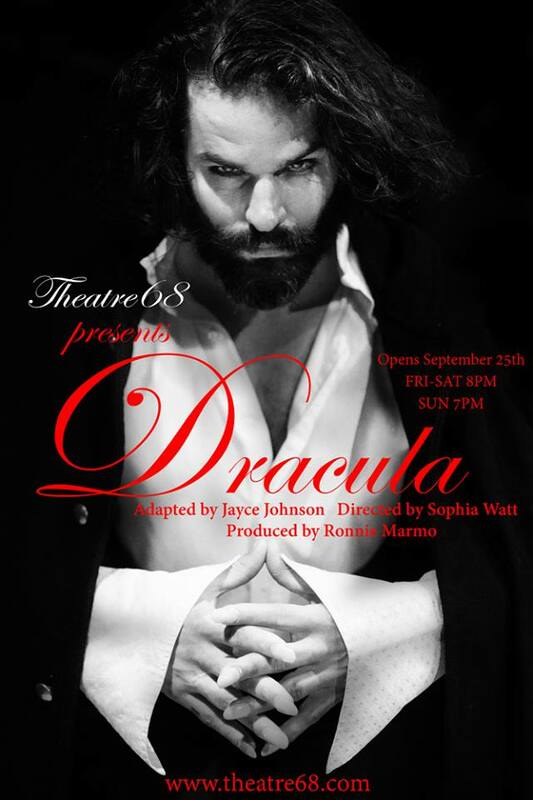 Now a new adaptation of Bram Stoker's most famous novel just opened, a Dracula explicitly referred to as a "feminist take.' Upon hearing of this, I was intrigued! Elsewhere I've described my reaction to the script. This review focuses upon the specific production happening right now in North Hollywood under the auspices of Theatre 68 which commissioned this script. Begin with the space. 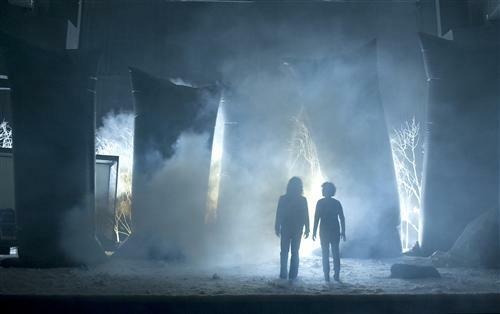 It caught my imagination instantly, not least because of an imaginative, even compelling pre-show (presumably the work of director Sohia Watt). Frankly, the rest of the show had a lot to live up to after following that! At times it even did. Frankly a big part of the blame for this last (which overstates it a bit, to be honest) lies in the script (see link above) which gives barely a hint as to the characters of Arthur (Diego Maureira) and Quincey (Kenneth James) or their mutual love interest Lucy (Ariel Hart), and a tiny bit more regarding Jack Seward (Jude Evans). Cannot blame the actors for not being given much of chance to show what they might do. Given how the rest of the cast measured up, I must conclude all the actors were of the same quality, but given unequal attention by the writer. This Dracula belongs to the character of Mina (Rachel Zink) , with interestingly many of the other major characters taking turns as enemy and ally to her. 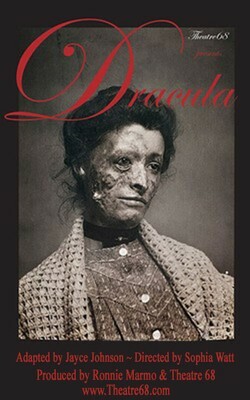 One measure of the actors who play Jonathan Harker (Jordan Wall), Professor Van Helsing (David Caprita), Dracula himself (Robert Homer Mollohan), Mrs. Westenra (Perry Smith) and the bug-eating lunatic Renfield (Kristen Lerner) is how all of them succeed in shifting between those roles. Overall, very well! 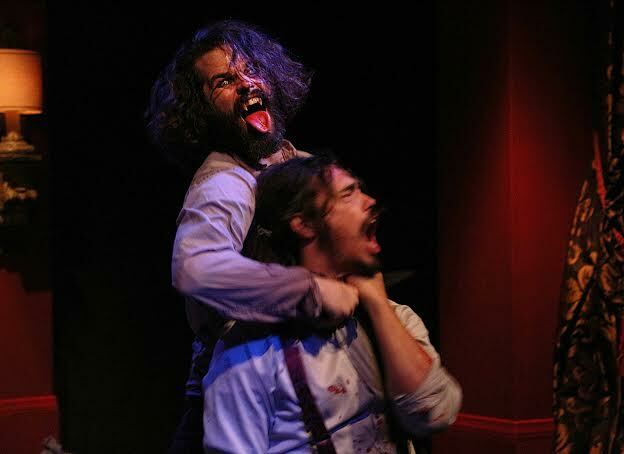 Mollohan lacked a little consistency, but that also seems inherent in the nature of how this play interpret the character--as a chameleon in some fundamentally emotional manner. He genuinely seemed to be enjoying himself, though, and in a very refreshing change of pace attempted at no time to channel Bela Lugosi, Frank Langella nor Gary Oldman! Bravo! Even his deliciously maniacal laughter proved motivated! Wall managed the curious balance of Harker, between strength and weakness, anger and tenderness with rather a lot of skill. I never liked him, but then I don't think we were supposed to. Felt sorry for the guy, though. Caprita's Van Helsing was such an over-the-top misogynist he could easily have been done as a villain from a melodrama. Yet instead he came across as very real, very malevolant in his way, and yet able enough to prove a useful ally. Sometimes. Lerner of course got the plum role. Renfield is to Dracula what Gollum is The Lord of the Rings. Small wonder David Manners (who played Harker in the Lugosi film) wanted to play that role--and at least one film adaptation conflated the parts of Harker and Renfield together! Again, the actor involved avoided a trap. Too often in playing madness the temptation exists to create a Batman-eque villain. Lerner avoided that, and (no less impressively) showed a complex set of relationships with those in her time onstage. Zink really carried the night, though, and did so with a fairly ugly journey of self-discovery. 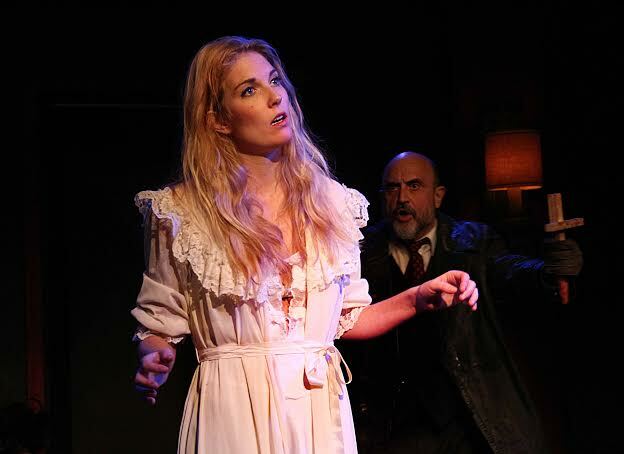 One of the tragedies inherent in this adaptation is the image of two different futures Mina can see embodied in Renfield and in the bitter, almost heartless Mrs Westenra. Because although feminist, this play does not take a Xena-esque approach by turning Mina into a fount of wisdom who puts the vampire lord out of his misery (this has been done a few times, most famously in Bram Stoker's Dracula as well as the Wildhorn musical). Rather, this version is more of a dystopia, a look into a society whose treatment of women makes savagry weirdly attractive. 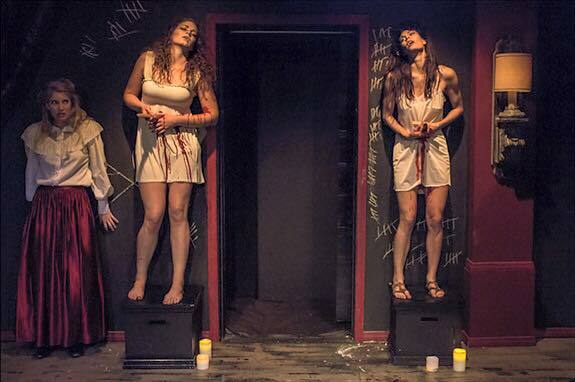 Along the way, much credit must go to the Succubi (Caroline Henry, Kara Gibson, Isabel Wagner, Anna Yosin) who function not quite as a Greek Chorus--mostly because they rarely speak while literally becoming the set as often as not. It proved a wonderful conceit, giving a dreamlike immediacy to the proceedings! Yet the nitpicker in me also wants to point out the English accents distractingly inconsistent. Generally the cast did a fine job in that respect (which deserves some applause right there) but the sudden pronunciations shifting from English to American did prove distracting--at least to my ear. Performances of Dracula are Fridays & Saturdays at 8pm and Sundays at 7pm through November 1, 2015. Tickets are $25. 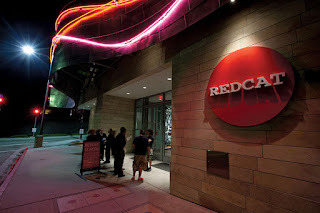 As a rule, I always enjoy performances at downtown's REDCAT. La Mélancolie des Dragons certainly marks no change in that pattern. Describing the performance however will prove a little tricky. Again, no change in the pattern. Shows in this venue rarely turn out safe or predictable. Mostly they come across as a ritual, with as much power and beauty as a high mass if you don't understand Latin--provided you prove willing to allow the experience itself to do what it will rather than trying to re-shape the event into a form more comfortable. Less eccentric. More linear. Vivarium Studios, which created La Mélancolie des Dragons (The Melancholy of Dragons--a title somehow absolutely perfect, although I cannot tell you why) emerged in 2003 Paris, aiming to create theatrical innovation. It became known for subtly, relatively simple sets, and exploration of ideas that critique modern society. The set up certainly seems simple enough. 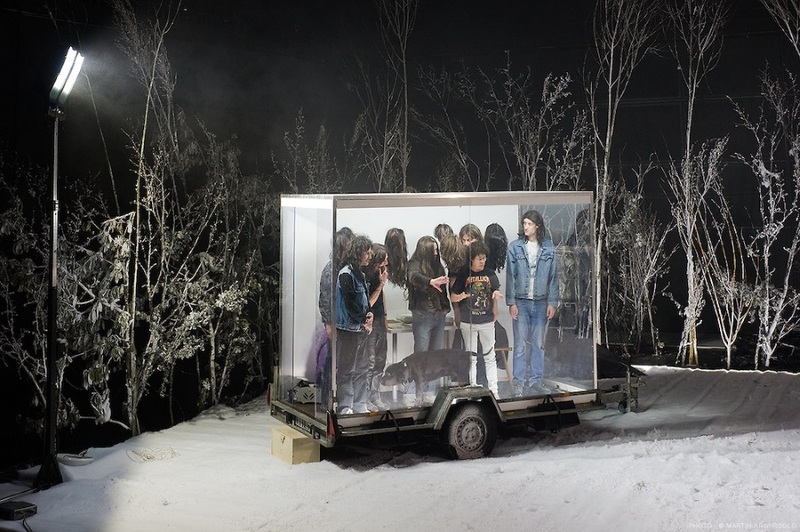 We see on stage a snow-covered landscape, trees taking up the edge of the space. A car, pulling a kind of van in back, seems stuck in the snow until a woman in a bicycle arrives. Her name is Isobel, and she soon figures out what is wrong with the car. It needs a part. Sadly, the local garage (she knows the guy who runs it) cannot get that part for seven days. So they are stuck. It seems. They don't seem heartbroken that their "tour" is to be interrupted. All six long-haired guys have a distinct 'heavy metal' air to them. They offer to show Isobel their show and she agrees. I can safely say what happened surprised me. But not with any kind of real shock. For a time I wondered if this nice and patient lady (she seemed middle aged) was about to become a victim of some horrific crime. After all the six "bandmembers" did feel...odd. Equally odd proved the 'attractions' they offered. But no crime proceeded to occur. And by the time anyone said anything even vaguely ominous we had come to know these men, to realize what kind of camp or event they were offering. A mini-oddyssey as it were, an exploration of the epic in the simple, the small. A series of wonders to behold in what some might call the most childish of pleasures. Well, why not? The grin awoken by a bubble machine. The fun of walking amid man-made smoke. A joke everyone 'gets' and can therefore enjoy, even if silly. Instead of the biggest, fastest, loudest, most dangerous roller coaster of all time (until the next multi-million dollar one gets made) we share (with Isobel, our surrogate for the evening) ordinary wonders, seemingly forgotten or just ignored. Even something as simple as a plastic bag can be as frightening as the most expensive CGI orc army. Just a wig hanging on a string near a fan while music plays can create an invisible rock star--to someone with a willingness to imagine, to dream. Shouldn't that be all of us? 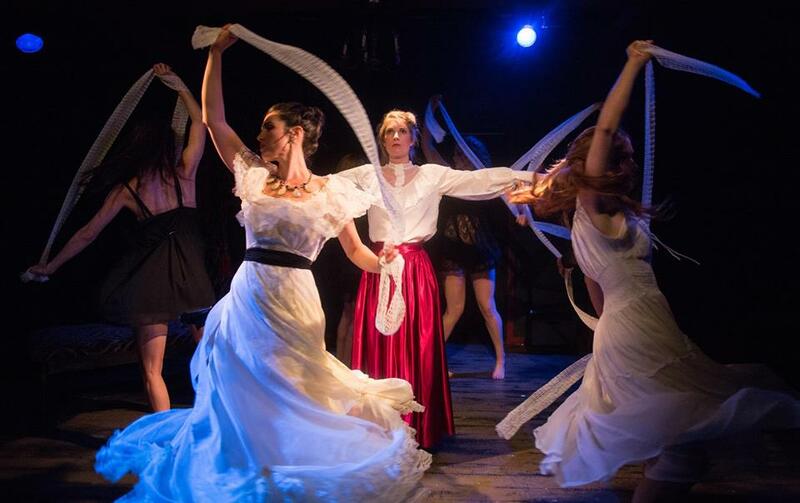 La Mélancolie des Dragons as of this writing has completed its short run at the REDCAT, appropriate in some way because--like all things--each experience by definition remains ephemeral. On the other hand, its company has performed the show before, presumably will do so again. I for one hope you get a chance to see it or some other piece by Vivarium Studios. For the record, I hope the same for myself. My applause was long the night I saw it. Nor was I alone. Nor was I the last to stop clapping. 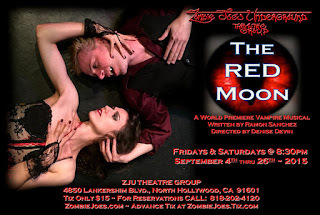 The Red Moon marks the first of four vampire plays I know to open this autumn in the Los Angeles area. 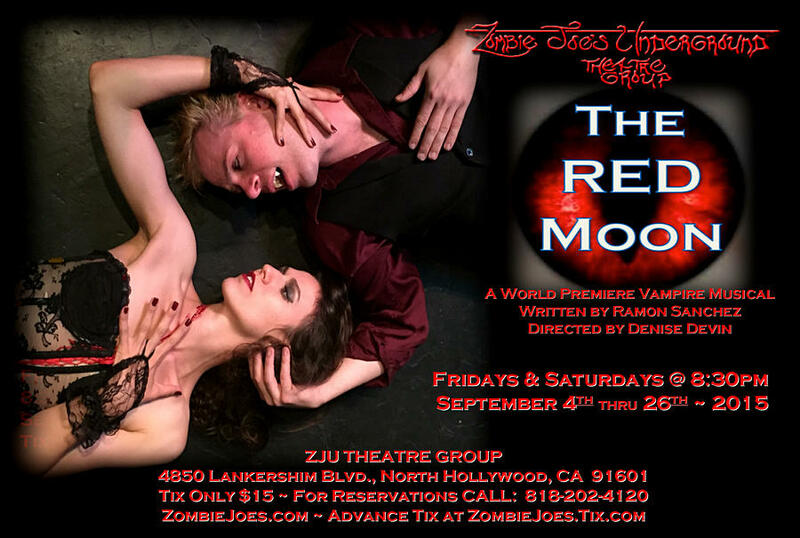 This one is at Zombie Joe's Underground Theatre, an original musical by Ramon Sanchez. Honestly, although I do recommend this show as genuinely fun and interesting as well as original in ways rarely seen in vampire fare, the script feels too short and in need of work. The story startled me as something truly interesting, a focus not on tribes or nations or the like but rather the fate of individual human souls. Yet it wouldn't work without a cast to breathe life into these characters. We would not care, if Roxanna (Lara Lihiya) did not grab our attention so much from the first time she struts on stage. Likewise the first words of the show are spoken by Lauri (Nicole Craig), the most mundane of character, the voice of the ordinary but not with contempt. Rather, she seemed real. A living human being. As did Anthony (Jason Britt), Lauri's friend who catches Roxanna's eye and soon joins her in the night. In case you hadn't figured it out yet, Roxanna is a vampire. Among other things her role is tricky because she has to jump back and forth between an exultant siren drunk with blood-lust, then a guilt-ridden young woman deeply ashamed of all she's done. No small feat. Yet carried out with great depth. To be sure all the major roles have their challenges. Lauri, for example, has the unenviable task of holding her own against two powerfully vivid and violent characters. Yet the actress in question carried it off! Likwise Anthony has this powerful duality the needs exposing on stage--and that is what I saw. Even as the most fierce and reckless predator of humans, we can see his loneliness, his fear of becoming again what he once was. Of all things, this is a love triangle with a man trying to win back a woman away from that woman's sister--which turns out not be a battle for her soul so much as his. A genuinely interesting, deeply dramatic idea, but little more than an idea without the cast. Honestly, they saved it. Because the script needs work. Not that it is in any way bad! On the contrary, the promise it shows really has me feeling a deep desire to see his next draft produced! But the lack of detailed backstory gave the actors more work than necessary (albeit they rose to the challenge). Also, other than the three leads Steven Alloway's Club Bouncer (with no name even) and Paul Carpenter's troubled Minister (ditto) alone seemed like characters really. They did a fine job with the little they had. Jackee Bianchi and Mariale Chiribao had even less to work with and did fine. I long to see what they might have done with more. Bottom line--lots of promise very neary eclipsed by some extremely fine performances. Director Denise Devin deserves a lot of credit for assembling this cast.